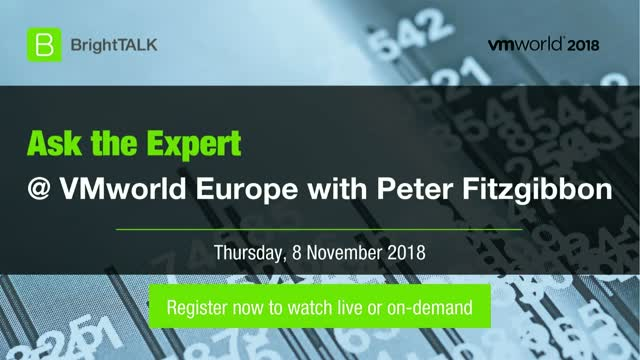 Tune in for a live on-camera interview with Peter Fitzgibbon, VP & GM, Rackspace, live-streamed directly from VMworld Europe in Barcelona. - VMware continues to evolve its position in the market, as a premier Vmware cloud partner, what is Rackspace doing to continue to evolve its positioning and products? - Diving deeper into that a little, what specifically are the use cases you are seeing around Vmware on AWS, and how mature do you rate that offering? - The Vmware provider space is becoming ever more crowded. What differentiates Rackspace versus the 4000+ other partners in the space? - What are the shifting trends that you are seeing in the cloud market? - What is your strategy and thoughts on “emerging” technology? How is Rackspace positioned in this market? VMworld 2018 Europe brings you four days of innovation to accelerate your journey to a software-defined business—from mobile devices to the data center and the cloud. Explore VMworld 2018. Technology-driven innovation is disrupting every market and industry. And it’s being created by people like you. You unlock value from today’s technologies while anticipating a rapidly approaching technological future. That’s why we created an event with you and your peers in mind. At VMworld 2018, VMware’s premier digital infrastructure event, you can find what you need to launch the digital transformation that relies on you. No matter what path you’re on, you’ll discover the technology, learn the trends, and meet the people that are shaping the future of digital business and taking IT to the next level. Welcome to a world where it all begins with you. Welcome to VMworld 2018.